In spring/summer 2016, CDF provided us with £25,000 to lead a legacy project to capture the contemporary value and future application of community development. We see this project as an opportunity for those who work with communities to reflect on progress and shape the future of community development. We also see it as a guide in how we best use the funding given to Local Trust by the Community Development Foundation (£596,000 including the £25,000). We’re committed to using the money wisely to think and act strategically about community development, over the long term. Our first step is to approach another potential funder to agree a way forward. To help with those conversations, we think the legacy project could run during 2017, with the research and evidence gathering happening between February and September 2017 and findings/product(s) being published in early December 2017 to coincide with 50 years since CDF was created. Our trustees think that a steering group of about twelve suitably experienced people could be established to oversee the project, to act as a sounding board and to sustain the quality and robustness of all stages of the project. Local Trust could to be a co-ordinator, convener and commissioner; rather than conducting the research directly. The focus needs to be on research and engagement, rather than ‘glossy’ end product(s). We and the steering group could set and answer a key question to frame the research. We propose the project is developed responsively, in stages, based on what is being learnt and who is engaged (rather than specifying all deliverables and rigid timeline/budget at the outset). There should be stakeholder involvement throughout. Engagement in the process (including events) should reach key stakeholders as much as the product(s) with the aim of benefitting the sector more widely by guiding future partnerships and funding strategies. The use of an open, staged process will enable us to bring in sector voices and expertise, balanced with the need to be heard beyond our sector. 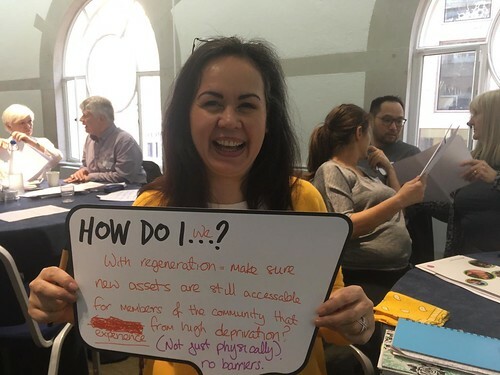 We want to influence those who have it in their power to invest in new ways of supporting communities: politicians, policy-makers at all levels, funders, practitioners, sector media, communities. We expect the project to focus on practical application and have real impact by identifying and promoting the benefits of community development to a wide range of influential audiences, across the four nations and a range of sectors, and at country, regional and local levels. We hope that it will convey political independence and build on CDF’s contribution to community development, while exploring the future role and scope for community development in the UK. We expect the project to be evidence-based, and to consider what community development can and could achieve, in the future. We will keep you updated on this work via our website and newsletters (sign up at the bottom right of this page); if you need more information about this project before then please contact Jayne Humm at Local Trust via our info@localtrust.knightstudiosdevelopment.com email address. Alison Seabrooke (former chief executive of CDF), has written an article explaining the relationship between Local Trust and CDF.